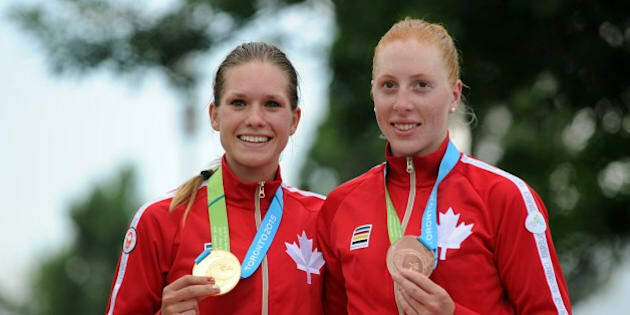 TORONTO — Canadian cyclist Jasmin Glaesser won her second gold medal while the host nation's men's basketball team settled for silver on the second-last day of competition at the 2015 Pan American Games. Glaesser won gold in the women's road race Saturday, sprinting away from the pack to win the women's road race in two hours 17 minutes seven seconds, finishing by half a wheel ahead of Cuba's Marlies Mejias. Canada's Allison Beveridge took bronze, 34 seconds behind Glaesser. "I let the Cuban rider lead it out a little bit and waited until the last possible moment to jump past her," said Glaesser, who was born in Germany but now calls Vancouver home. "When I knew I got out ahead of her, it was just the best feeling in the world." The men's basketball team lost their bid to join the women as Pan Am champions when they were defeated 86-71 by Brazil in the gold-medal game. Canada trailed by 25 points at one point in the third quarter. The team brought some life to Mattamy Athletic Centre when it reduced the deficit to six points, but Brazil calmly withstood the comeback bid and pulled down crucial late rebounds to keep Canada away from the ball. Canada still earned silver, its best result in Pan Am Games history. Its previous top finish at the Games was fourth in 1983. "I think I'm too much of a competitor right now to feel good about anything," said Canada head coach Jay Triano. "I don't like losing a game like that. But at the same time I think when we look back and reflect, we grew up throughout this tournament, we also grew up in this game a little bit. We got knocked on our heels but we never quit, we came back and I think the guys really played in the second half." Anthony Bennett led Canada with 18 points. In athletics, Winnipeg's Nicole Sifuentes and Toronto's Sasha Gollish captured silver and bronze in the women's 1,500 metres. Sifuentes finished in 4:09.13 while Gollish crossed in 4:10.11. Muriel Coneo of Colombia won gold. Dan MacLelland of Kitchener, Ont., added a bronze in men's singles bowling while Ottawa's Eugene Wang settled for bronze in men's singles table tennis when he lost his semifinal 4-3 to Brazil's Hugo Calderano. The medals boosted Canada's total to a record-breaking 202 — 73 gold, 65 silver and 64 bronze. The previous record was set during the Winnipeg 1999 Games where 196 medals were won. The United States leads the table with 95 gold and 246 total medals. Canada had a chance at more medals Saturday in track and field, boxing, and field hockey.